This Museo Mundial installation focuses on several topics, including the limited supplies of raw materials and peak oil, a term describing the point in time when the global production of oil reaches its maximum rate. Emissions, the impact of climate change on so-called developing countries, alternative and sustainable sources of energy, and conflicts connected to oil (WWII, Nigeria, Niger, Sudan etc.) are other topics covered. Under the last two topics in particular, we mention how the issue of fossil fuels and renewable energy affects rich as well as poor countries around the world. The installation was created in conjunction with the artist Vladimir Turner. 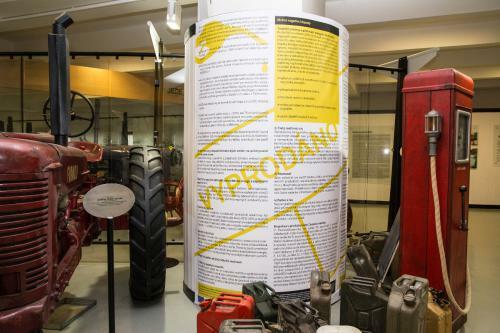 It is located at the beginning of an exhibition on tractors and agricultural engineering in the National Museum of Agriculture in Prague. 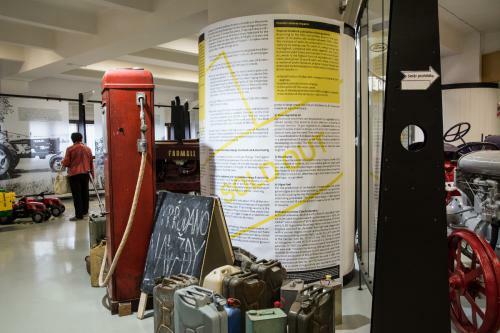 The permanent exhibition includes an antique oil pump with a sign “SOLD OUT” hanging on it. The oil pump is surrounded by empty cans. These artefacts remind us of the oil crisis in the seventies. Behind the pump is an exhibition board displaying data on global oil production and consumption as well as on the consumption of petroleum products in the Czech Republic. It is accompanied by information on potential substitutes for oil in the present day as well as before WWII. In addition, the installation includes a projector that projects three animated maps onto the floor. One of them illustrates oil extraction, the second shows conflicts related to oil, including the Second World War, and the third shows the long history of oil wars that are directly related to the so-called developing countries. The projector is activated by motion sensors as soon as people enter this area of the museum. We wanted to create an installation on problems related to fossil and renewable fuels. Therefore, we collaborated with the NGO eurosolar.cz, which provided us with a lot of useful information. We also contacted some artists and discussed with them the possibility of creating an installation on this topic. We received a lot of very interesting proposals. This step took us one month. Finally, we decided to collaborate with Vladimir Turner, who is well-known for his audio-visual art and public interventions. We decided to build on the permanent exhibition on tractors, which also includes an antique oil pump. He designed an installation based around a representation of the oil crisis in the seventies: empty gas stations and pumps with no gas. It took us about three weeks to complete this step. The supporting NGO carried out essential research and wrote the final texts for the exhibition. This step took two weeks. We informed the museum that we wanted to use the permanent exhibition for our installation. We were expecting some resistance to the idea, but the museum’s board was very open to our proposal and gave us the go-ahead. This step took about a week. During the preparation it happened, that one part of the installation expanded. We wanted to illustrate some information through the projector. So we had to create animated maps which took us seven weeks. Finally one of the simplest installation in our opinion changed into one of the most complicated. Due to the technical complexity involved, the artist, the technicians and the museum employees needed to work closely together, but sometimes it was difficult to coordinate them all. That was the reason why the implementation took three weeks. The combination of contemporary artefacts, historical items and visual projection makes for an interesting installation. We were so creative that what started out as a straightforward installation developed into one that was almost too complicated. That would not have been such a problem if the budget had not also increased in line with the installation’s complexity. However, thanks to the understanding of our partners, this issue was not so critical. The changes during the process also led to delays and the installation took us longer to complete than we had expected.